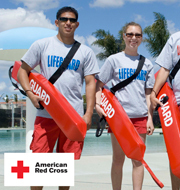 Happy Fish Swim School is an Authorized Provider of American Red Cross Lifeguarding courses. Courses are lead by experienced instructors who are dedicated to serving the community. Happy Fish conducts full courses and challenge (re-certification) courses at both Fremont and Livermore facilities. Happy Fish also offers very competitive rates to conduct private safety courses at your facility. If you have any questions regarding American Red Cross courses or to contact one of our instructors please leave a message on our Contact Us page. Are you looking for an exciting job this summer? Happy Fish can teach you how to be a professional lifeguard. This course will focus on injury prevention, aquatic safety, CPR/AED training, first aid, and spinal management. Please bring a swimsuit and towel to class everyday (goggles optional, but recommended). Each class will have a 45 minute lunch and two short breaks. Students will be provided with a CPR pocket mask and lifeguard manual to use during the class. Students can keep the pocket mask and obtain a digital version of the book online for free. Physical lifeguard manuals can be purchased for $40. • Must be 15 years of age by the end of the class. • Must be able to swim 300 yards consecutively. • Must be able to retrieve a 10 lb. brick from 7 ft. and kick on your back for 10 yards in under 1 minute and 40 seconds..
• Must be able to tread water for 2 minutes without using your arms (hands tucked underneath your armpits). Students must attend ALL specified classes. If you have already completed your Lifeguard certification, then you must challenge the course every 2 years to show you still possess the knowledge and skills to continue working as a professional Lifeguard. You must bring a swimsuit, towel, and your pocket mask. If you do not have a pocket mask you can purchase one at Happy Fish for $15. Please remember to study as you will not be able to re-take challenge tests. American Red Cross has a new review website at www.RedCross Refresher.com.